Knowledge is defined as remembering of previously learned material. This may involve the recall of a wide range of material, from specific facts to complete theories, but all that is required is the bringing to mind of the appropriate information. Knowledge represents the lowest level of learning outcomes in the cognitive domain. Verbs: arrange, define, duplicate, label, list, memorize, name, order, recognize, relate, recall, repeat, reproduce state. Comprehension is defined as the ability to grasp the meaning of material. This may be shown by translating material from one form to another (words to numbers), by interpreting material (explaining or summarizing), and by estimating furture trends (predicting consequences or effects). These learning outcomes go one step beyond the simple remembering of material, and represent the lowest level of understanding. Verbs: classify, describe, discuss, explain, express, identify, indicate, locate, recognize, report, restate, review, select, translate. Application refers to the ability to use learned material in new and concrete situations. This may include the application of such things as rules, methods, concepts, principles, laws, and theories. 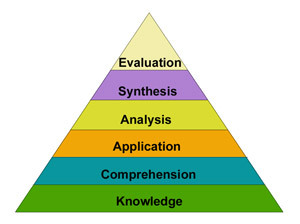 Learning outcomes in this area require a higher level of understanding than those under comprehension. Verbs: apply, choose, demonstrate, dramatize, employ, illustrate, interpret, operate, practice, schedule, sketch, solve, use, write. Analysis refers to the ability to break down material into its component parts so that its organizational structure may be understood. This may include the identification of the parts, analysis of the relationships between parts, and recognition of the organizational principles involved. Learning outcomes here represent a higher intellectual level than comprehension and application becasue they require an understanding of both the content and the structural form of the material. Verbs: analyze, appraise, calculate, categorize, compare, contrast, criticize, differentiate, discriminate, distinguish, examine, experiment, question, test. Synthesis refers to the ability to put parts together to form a new whole. This may involve the production of a unique communication (theme or speech), a plan of operations (research proposal), or a set of abstract relations (scheme for classifying information). Learning outcomes in this area stress creative behaviors, with major emphasis on the formulation of new patterns or structures. Verbs: arrange, assemble, collect, compose, construct, create, design, develop, formulate, manage, organize, plan, prepare, propose, set up, write. Evaluation is concerned with the ability to judge the value of material (statement, novel, poem, research report) for a given purpose. The judgements are to be based on definite criteria. These may be internal criteria (organization) or external criteria (relevance to the purpose) and the student may determine the criteria or be given them. Learning outcomes in this area are highest in the cognitive hierarchy because they contain elements of all the other categories, plus conscious value judgements based on clearly defined criteria. Verbs: appraise, argue, assess, attach, choose compare, defend estimate, judge, predict, rate, core, select, support, value, evaluate. Reference: Major categories in the cognitive domain of the taxonomy of educational objectives (Bloom, 1956).